Growing cress can be done indoors or outdoors, with or without soil. When growing inside you could use sprouting tray. The seeds need exceptionally low attention to germinate. Besides enough fluid and a tiny bit of light, cress only needs some grip to grow. It will grow just as well on a piece of kitchen paper. Another way to grow is to use potting soil. This has the advantage that the seeds get more nutrients, and thus obtain a much richer flavor, in addition, the yield per seed is much bigger. Only a thin layer of soil could be used to achieve this additional effect. A disadvantage of using earth may be there could be soil attached to the cress leaves. This can be prevented by sowing cress on top of the soil, and watering it from above. Cress sprouts after 1 day. Here, the seeds are sprinkled ón the soil and then watered with a plant spray. Another advantage of growing with humus is faster growth, both in height and width. In our experiment earth vs paper towel this becomes clearly visible. In this video you’ll see a beautiful time lapse of the cress growth cycle. Remember to set the quality ‘high’, and see it grow. When outside, cress is usually sown in strips. School gardens sometimes use fun shapes like for example a letter of a first name. If you want fast, lots and tasty cress to grow you might as well sow a complete area evenly altogether. With most small bags (10g) of cress seeds you’ll be able to fill a 10ft² area. Note that this doesn’t apply to indoor cultivation on paper because then the yield is much less. Sown indoors, cress can be harvested and eaten after about 7 days. It could be advisable to put the sprouted cress in the fridge so it only grows slowly, hence is long available in the most optimum freshness. You can keep harvested cress fresh in the fridge for about a week. When you harvest a large amount of cress from a vegetable garden you can keep it fresh for a few days when stored in fridge. Light obviously has much influence on the growth process, also with cress. 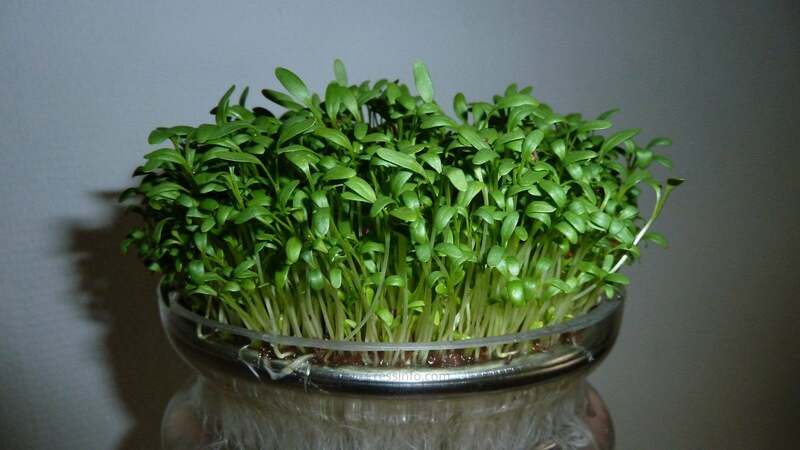 Whenever you prevent light coming near sprouting cress it will continue to grow upward and get pale, yellow leaves. This is because, when light is scarce, the plant will just try to keep growing until it finds some light. See our experiment dark vs light. Does cress regrow after you cut it? Basically not. However, often there are still small seedlings among the already mature plants. They may still be able to thrive after a first harvest. How much water does cress need? 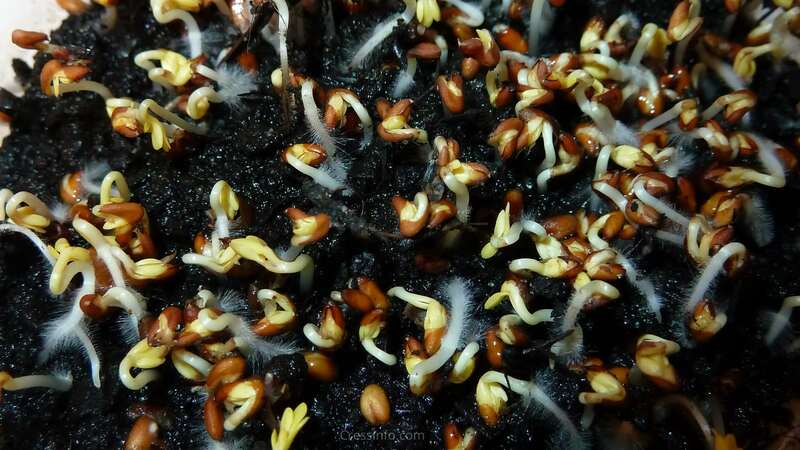 When you grow cress indoors on cotton or earth it is best to spray the seedlings wet every day. To kickstart the growth it’s a good idea to completely immerse the seeds in the beginning. However, beware of mucus. If you suffer from it stop giving water until things dry up a bit. On the contrary, whenever you forget to water the cress they will tumble down easily. Make sure you re-moisture them within a day time and they will recover. Can you eat cress seeds? Cress seeds are used in a popular dessert in central Asia: Falooda. The seeds must be soaked to make them softer. It has a distinctive flavor. See our Falooda recipe.